The doors of Dunder Mifflin are closing. But the misplaced chairs and corporate blandness of white collar work are here to stay. 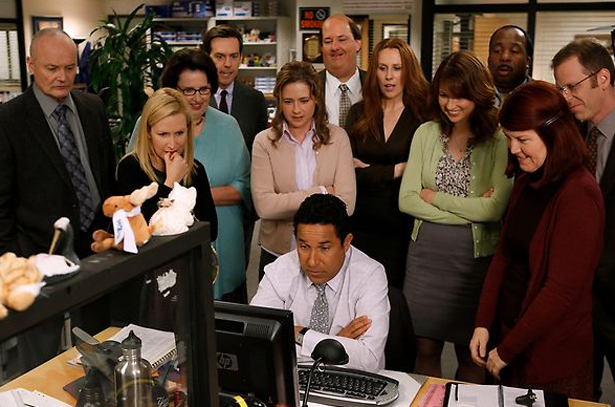 The Office, which ends May 16, will take with it one of a precious few vaguely realistic depictions of working life off the air. Granted, the people who write about television haven’t been watching The Office for some time now. Partly that’s because Steve Carell left and partly because, I think, the longer we were in a recession, the less appealing an extended workday got. Either you’d lost your job, and the show reminded you, in slightly funnier form, of the life you’d once been leading. Or else, at a certain point, the drudgeries of the workplace had quit seeming all that funny. Some of you will object that your workplaces were never anywhere near as full of character as the Dunder Mifflin paper company. Or, for that matter, the Wernham Hogg paper company that preceded it in the United Kingdom. To this contention I must present this story from my own experience: I once worked with a man who, apropos of absolutely nothing, purchased a lazy-boy chair and had it put in his midtown Manhattan office. At the time of this purchase, he was at best a rather junior employee. Everyone in the office began to wonder why he had purchased this chair, which suffice to say did not match the prevailing décor. In fact, we all referred to said employee as “The Chair,” basically forever after. It used to be a kind of sport to watch people walk down the hallway, glance casually into the door of his office, and come up short, realizing that yes, that was a recliner in that tiny office. Then there was the employee with a slightly mysterious personal life who, when asked by the firm newsletter what his favorite place was, offered this reply: “Somewhere warm and deep.” We parsed that for weeks. It passed the time. My point is that the The Office understood this sort of everyday absurdity. Sure, sometimes the storylines got a little wacky. But I was recently rewatching an episode in which Michael Scott (Carell) is explaining that he has brought everyone on a booze cruise because the office is just like a ship, and he is the captain, and it’s all a bit like Titanic (“No, I’m Leo DiCaprio, come on!”), and the sales department is the furnace, etc. And it dawned on me, watching it, how perilously close this is to a lot of the corporate pablum that is peddled, often enough, as “training exercises” in companies across America. The humor cut rather close to the bone. You don’t need to have your boss actually getting to the point where he screams “I’m the King of the World!” from a ship’s prow to see that. It hasn’t been news, in America, that the conditions of modern work are unfulfilling, for a good half-century now. It’s a theme of the novels of Richard Yates, the classics like Revolutionary Road and Sloan Wilson’s The Man in the Grey Flannel Suit. The deadening forces of advanced capitalism have been studied just as long, in books like The Organization Man. But the upshot tended to be doom and depression. This might explain why other classic workplace sitcoms—The Mary Tyler Moore Show, M*A*S*H, Night Court—usually had some kind of meaningful work as the backdrop, accomplishing something important on the side of all their jokes. Or else, as in sitcoms like Designing Women or Newhart, the main characters were at the very least all really good friends, engaged in some kind of collective endeavor. This is not true of Dunder Mifflin, where the co-workers were assembled more or less only for reasons of common employment. Nor is it really altogether clear what this company does within the context of the sitcom, though NBC’s marketing people created a whole website to describe the business. Instead, the entire appeal of the show was predicated on the sharpness of the satire. At first, in The Office’s American life, the show was rather too cutting for audience’s taste. But by the second season it was somehow managing to mix the satire with affection. It wasn’t so much that unlikable characters became likable; it was that they became recognizably human in their unlikableness. They began to look, in short, like people trying to make the best of a bad situation. Which only amplified their resemblance to the real world of American workers. Out here no one is under the illusion that the bulk of the work they have to do to make a living is meaningful. And you have to laugh, sometimes, because you’d cry otherwise. That’s the ray of hope, the laughing. The thing that keeps you going to work, and also helps you keep a critical consciousness about the whole enterprise of paying the bills in America. In that sense, you could even say that Kelly’s doing a cheer routine about “B-A-N-A-N-A-S” or Dwight Schrute’s informing the office that he is “capable of physically dominating [it],” are small but crucial acts of rebellion. The only way you’ll ever want to change things is if you are high up enough to see the absurdity of them. The Bangladeshi factory floor is a world apart from Dunder Mifflin. Read Elizabeth Cline’s take on last week’s disaster.